Hudson Valley is a gorgeous, underrated region of New York State. The area’s dramatic landscapes and its proximity to New York City, have made it a premier wedding destination for couples. The forest location of the Hudson Valley Wedding Pics gave the day a natural sense of peace and beauty. The venue that hosted the the nuptials, the Arrow Park Lake and Lodge, only added to that feeling of serenity. The mansion at Arrow Park, the grounds, and the views of the lake and the woods surrounding the property made for captivating Hudson Valley Wedding Pics. It was a perfect spring day, with the bride and her maids in flowing neutrals and their hair adorned with white flowers. 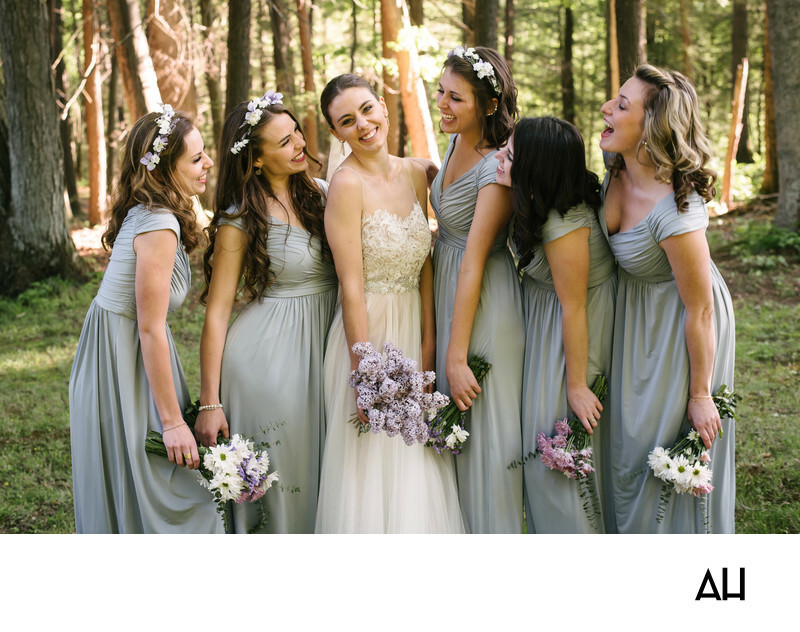 In this picture the bridesmaids surround their friend and sister, happiness radiating from their faces. The bride is the center of attention. She holds a delicate purple and white bouquet that goes well with the ethereal beauty of her gown. Her nose crinkles and her smile is wide as her maids look to her, sharing in the joy of the moment. The scene was like something out of a storybook, and the girls looked like fairy princesses. For many of the pictures I took, I opted for capturing candid moments between the bride, groom, and bridal party. These photos provide the couple with genuine evidence of happy times of their wedding day. From country clubs like The Garrison to farms like Blue Hill at Stones Barns, Hudson Valley has everything to offer for wedding pictures.